Although he was best known for his pioneering contributions to both minimal music and structural film in the 1960s, his work helped define a vast range of culture, including rock music and public television. He once declared in an interview, “You don’t know who I am, but somehow, indirectly, you’ve been affected by things I did.” Introducing Tony Conrad: A Retrospective, the first large-scale museum survey devoted to artworks Conrad presented in museum and gallery settings, is part of an ongoing reappraisal of his creative achievement. Indeed, because of the extraordinary scope of Conrad’s contributions to art and culture, this retrospective may yet be seen as only an “introduction.” Inspired by the spoken, written and performed introductions Conrad regularly used to help frame screenings and presentations of his works, it shows the artist to be an unparalleled innovator in the mediums of painting, sculpture, film, video, performance and installation, tenaciously working to challenge the boundaries between artistic categories. Conrad’s first experience in film came from his creative partnership with Jack Smith as the sound designer for Smith’s best known works, Scotch Tape (1959-62), Flaming Creatures (1963), and Normal Love (1963-64). Conrad’s musical work informed his breakthrough film debut, The Flicker—a radical reduction of the cinema to its most essential properties: light and darkness, black and white, sound and silence—that brought film fully into the emergent minimalist art movement. With subsequent works such as Straight and Narrow (1970), Coming Attractions (1970) and Four Square (1971), Conrad created some of the purest and, to this day, most arresting examples of structural film. This film series is part of Introducing Tony Conrad: A Retrospective. Originally organized by the Albright-Knox Art Gallery with the support of the University at Buffalo Art Galleries, this multi-part exhibition is on view at the Carpenter Center for the Visual Arts and the MIT List Visual Arts Center from October 17 – January 6. Special thanks: Dan Byers, John R. and Barbara Robinson Family Director, and Daisy Nam, Assistant Director—Carpenter Center for the Visual Arts; and Henriette Huldisch, Director of Exhibitions & Curator—MIT List Visual Arts Center. The exhibition reception takes place at the MIT List Visual Arts Center (5 – 7:30pm) and at the Carpenter Center for the Visual Arts (6:30 – 8pm). Straight and Narrow is a study in subjective color and visual rhythm. Although it is printed on black and white film, the hypnotic pacing of the images will cause viewers to experience a programmed gamut of hallucinatory color effects. Straight and Narrow uses the flicker phenomenon not as an end in itself, but as an effectuator of other related phenomena. In this film, the colors, which are so illusory in The Flicker, are visible and under the programmed control of the filmmaker. Also, by using images that alternate in a vibrating flickering schedule, a new impression of motion and texture is created. This work is one of the most austere and highly structure-dependent films ever, made without images other than six patterns of alternating black and white imposed upon the full surface of the film strip. This is a notorious film; it moves audiences into some space and time in which they may look around and find the movie happening in the room there with them. Much has been written about The Flicker. It is a library of peculiar visual materials, referenced to the frame-pulse at twenty-four frames per second. All flickering light is potentially hazardous for photogenic epileptics or photogenic migraine sufferers. 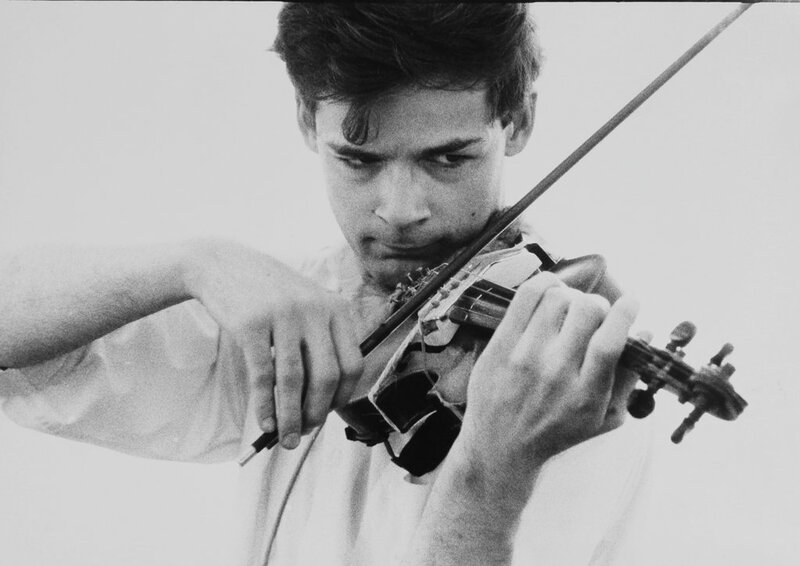 Hubby’s affectionate and insightful portrait of Tony Conrad offers an excellent overview of the career and vision of a polymath and multifaceted artist, making wonderfully clear Conrad’s indelible contributions to both experimental music and cinema. Closely following Conrad at work, on the road and in an ongoing conversation about art and creativity, Hubby’s debut feature effectively and poignantly captures the voice and vision of a true pioneer. Taking place at the Carpenter Center for the Visual Arts and MIT List Visual Arts Center. In collaboration with Claire Chase, Harvard University Music Dept. Professor of the Practice and Neil Leonard, Artistic Director of the Berklee Interdisciplinary Arts Institute. The following is a selection of video works principally from Conrad’s Authorized to Surrender: A Video Retrospective, 1977-90. Conrad’s first video work, Cycles of 3s and 7s, resembles much video art of the 1970s: recorded in a single take, the grainy footage documents the artist performing a repetitive action for the camera in his studio. Conrad was a math major in college and former computer programmer, and here he punches calculations into a handheld calculator, assuming the demeanor of a friendly math teacher (a role he would reprise in the cable program Homework Helpline (1994–95), also on view in this exhibition). However, the video is as much about music as it is about math, building on Conrad’s lifelong rejection of traditional methods of composition. By repeating the numbers three and seven, he creates ratios associated with non-Western music, and as Conrad himself noted, the sound of his voice narrating the calculation of these ratios takes on a rhythmic quality, creating a kind of computer-generated song. In collaboration with Non-Event, this performance takes place at the MIT List Visual Arts Center.